I feel like I fell off the face of the earth. No blogs, no emails, no nothin' for almost a month. Moving house was a lot tougher than I thought it would be. I have never walked up and down so many stairs in my life. Too bad our elevator plan fell through. I have aches and pains where I didn't even know I had parts. My muscles have sore muscles. My eyelids hurt and every part of me is saying WTF? This isn't what I saw in "House and Garden"
Don’t make the mistake of thinking you have a whole year to sort through your stuff. 24 hours before you move, you’ll be cramming socks into drinking glasses, and stuffing them into the box marked “tax files”. If you hire movers, hire ones with a sense of humor. The guys doing our move were great. They were quick and efficient, and had helpful suggestions regarding our book collection. "Read 'em, get rid of 'em"! Apparently art books are on the heavy side. (Sorry guys)! If you have a cat and you’re worried that he’ll be upset when you switch homes, forget it. New things to watch, new places to sit, and he doesn’t have to unpack his own stuff. The cat is relaxed and happy. Don’t plan on making a pancake brunch the first weekend in your new kitchen (especially if you can't cook, but get caught up in the excitement of having a different space). You might find that you have no measuring cups, the milk has soured, the cord to the electric frying pan has gone AWOL, and your mix looks like a lumpy glue concoction. Aim for toast. Better still, get some strawberries and champagne - at least you'll feel like you're doing something special! Even better than that, eat out! Garbage bags on the windows might be necessary for a few nights until you have curtains. This might scare the neighbors (old hippies or mafia moving in!) but they’ll appreciate you all the more when they see real material go up. Most importantly, know that you can’t get this all together in a week. 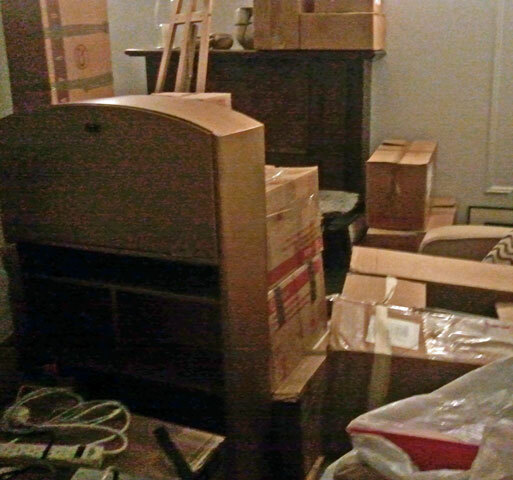 A month maybe…..if you lived with your parents until you were 35 and haven't started buying your own furniture. I'm prepared to stay in this place until they move me to a home. If it turns out I hate it, I'm staying anyway. RELIEF is spelled O-F-F-I-C-E. Back to work is a pleasure. Nothing to haul, carry, put together or take apart. I can stay in my chair all day if I want. Whoooo. At this point, I want!! !